Do you remember the Three Little Pigs? Goldie Locks? Rapunzel? The Little Boy Who Cried Wolf? The Princess and the Pea? 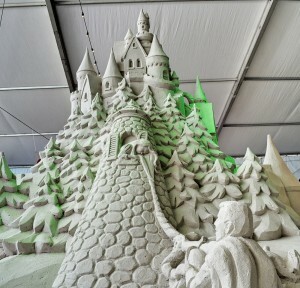 Clearwater Beach, Florida brought those and a host of other fairy tales into the realm of three dimensions at the Pier 60 Sugar Sand Festival . 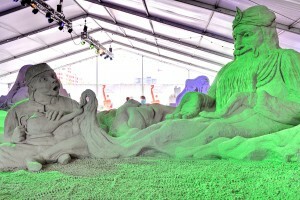 At a mere ten dollars a ticket, visitors gained entrance to the large tent protecting the sand sculptures. A path led through the artwork, the trail composed of nothing more than ordinary beach sand which is there all year round. 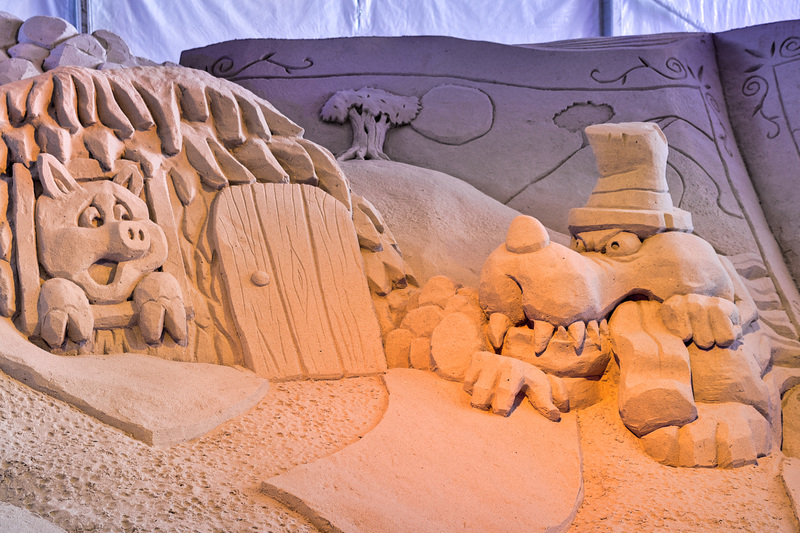 Guests were treated to close up encounters with their favorite fairy tales. Viewers discussed each pieces, many trying to recall the names of certain fairy tales or quotes from the stories. Sculpted into the sand of some of the pieces were their titles, helping guests along while presenting some striking three dimensional fonts. Colored lights alternated from one shade to another, helping to enhance the shadows. To immerse spectators further, a soundtrack played in which snippets of fairy tales were read. The walkway wound end to end inside the very large tent. 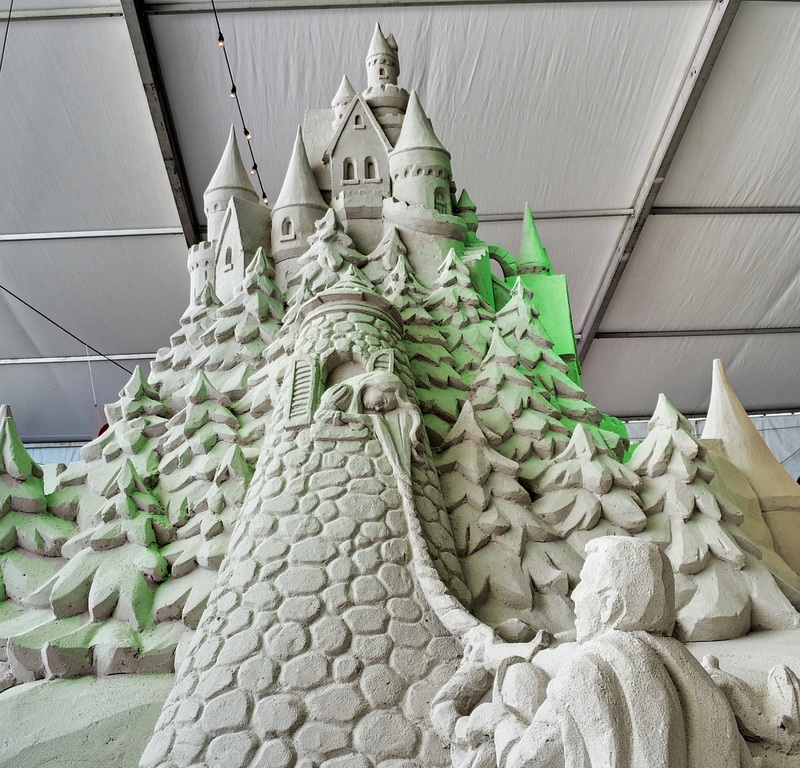 The trail led guests through the fairy tale renderings, passing by a photo op in front of a fairy tale castle at one end, and a sculpture contest at the other. 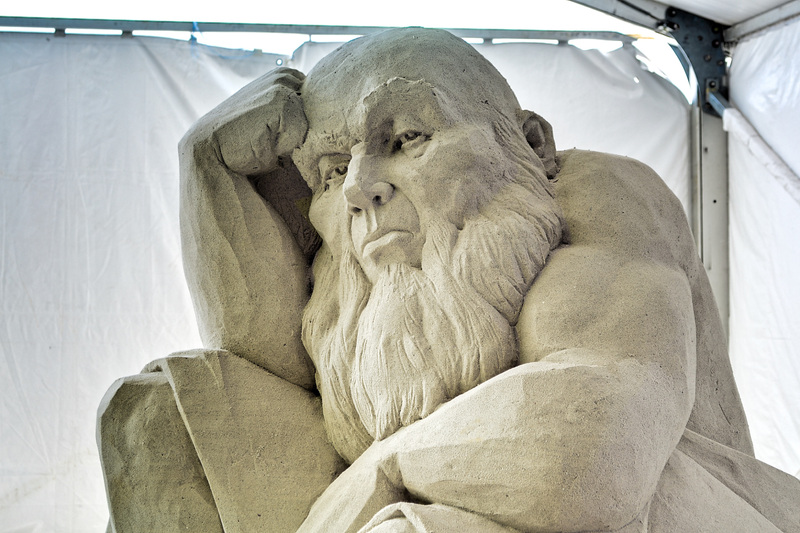 Loads of interesting sculptures waited in between, making a visit to the ten day Sugar Sand Festival a worthy outing for both area visitors and local residents. 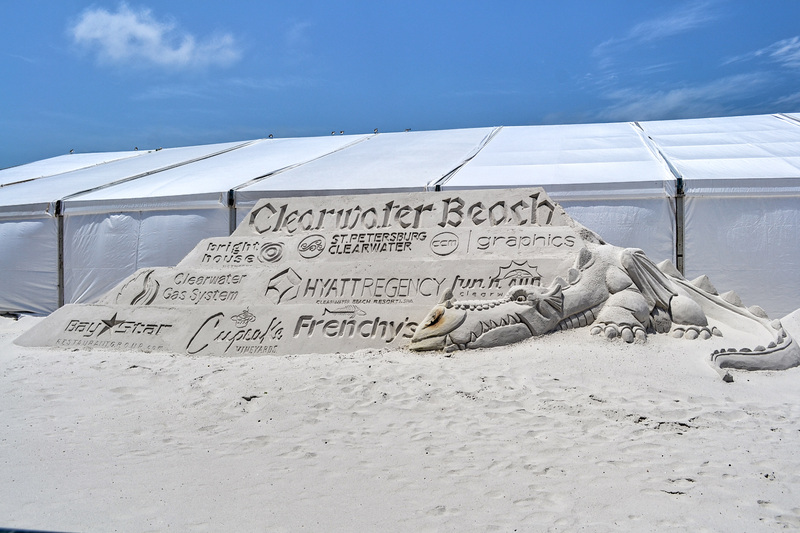 This year marks the centennial anniversary of Clearwater, Florida. 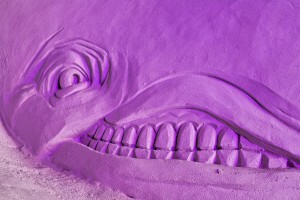 The one hundredth birthday of the community was marked with a sand sculpture of a giant birthday cake at the exit to the event. Another local feature that made its welcome return to the Sugar Sand Festival was Winter the dolphin, this time with her friend Hope to help her along. The two real-life dolphins star in the Dolphin Tale movies which have brought a dose of unexpected fame to the area. 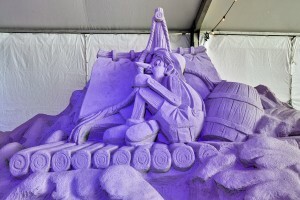 The other sculptures that did not follow the fairy tale theme were those from the sculpting contest. A handful of artists pitted their skills against one another at the south end of the large tent. All contest designs were well done, as you might imagine, some including remarkably intricate detail. 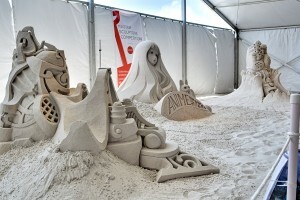 The the contestant themes ranted from mechanical structures to the abstract art in three dimensions. Visitors were encouraged to vote for their favorites. 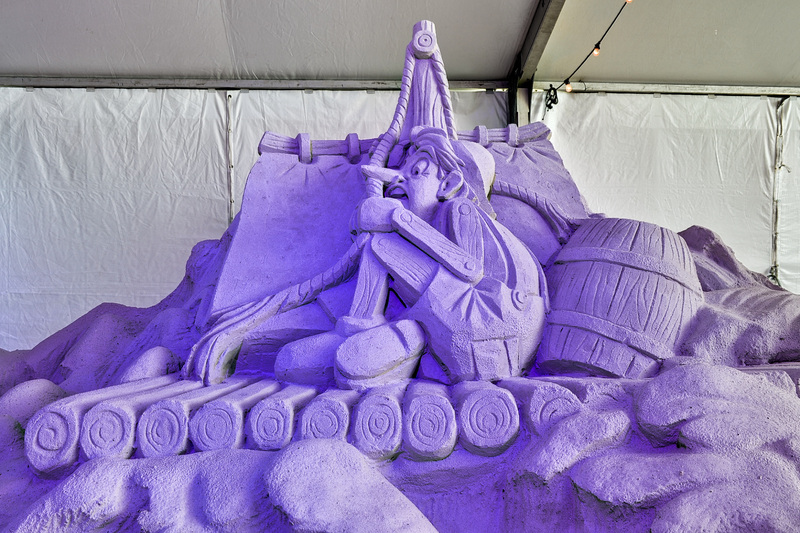 One of the best features of the 2015 Sugar Sand Festival was the upkeep of the sculptures. 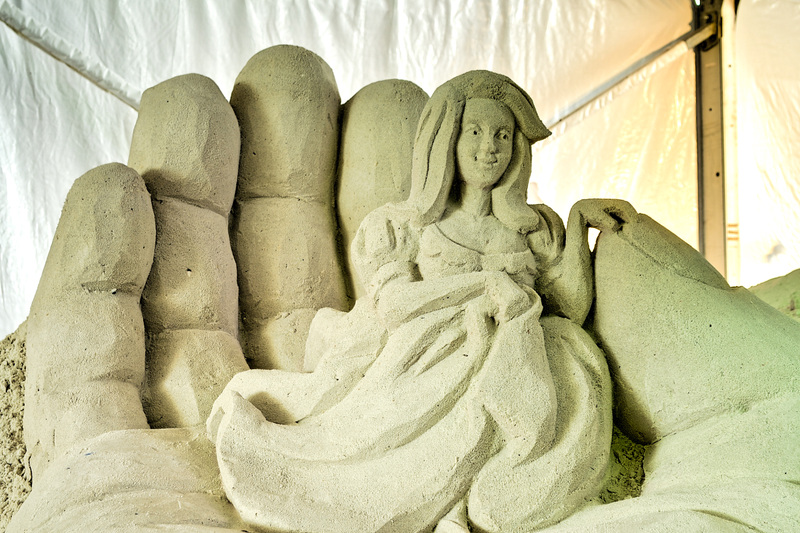 Not only were sculpted pieces maintained and repaired throughout, new pieces appeared all week long. Team Sandtastic, a traveling group of sand sculpture artists, was responsible for the majority of the sculptures seen at the event. A talk with one of the team members revealed some interesting tidbits. The one sculptor we spoke with was responsible for several tons of sculpted sand within the tent. The event itself boasted a weigh in of 1000 tons of sand. An interesting and interactive feature was the chance to get a photograph in front of a giant fairy tale castle made by the team. Guests could take home the photo from a booth outside that also sold photo booklets from the event. Pier 60 was bustling all week long. On an ordinary day, souvenir vendors line the pier for four hours a night at the Sunset Festival. Street performers entertain the crowds juggling fire, tumbling, dancing, or displaying a host of other talents. 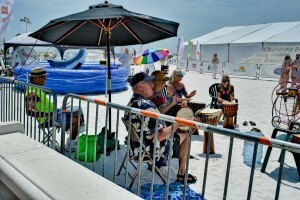 For the Sugar Sand Festival, vendors set up all day long, every day of the festival. Evening is always the prime time for street performers, but one or two could be found at almost any hour during the ten day event. 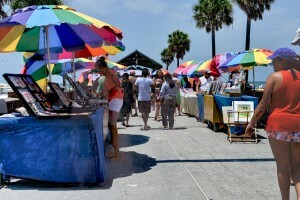 In addition to the additional availability of souvenirs, a number of food carts set up along the sidewalk and on the sand to serve treats to the passing crowds. T hrown into the mix was a swimming pool where visitors could float in giant inflatable bubbles, an interactive drum circle, a sand castle building area for the kids, and even a mechanical “bull” in the shape of a shark. 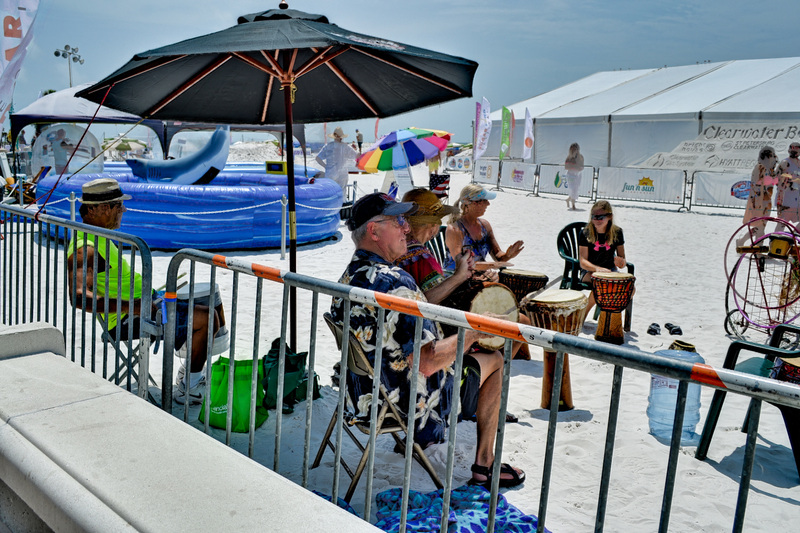 On the two weekends, bands play on a stage set up on the beach. 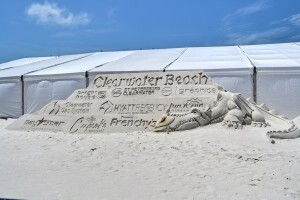 The sands of Clearwater Beach were the venue for those who attended the shows. The extra activities, the food, and the music surrounding the sand sculpture tent made the event a thrill to visit. The Clearwater Beach Sugar Sand Festival was as fun as expected. Last year set a high bar that this year’s event succeeded at meeting. The event drew plenty of extra attention during a time of year that ordinarily sees fewer visitors. 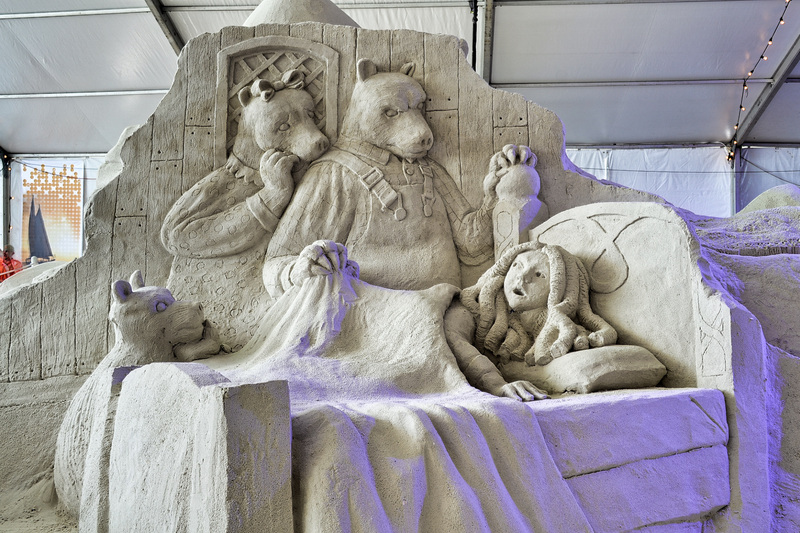 Artists transformed the beautiful white sands of Clearwater Beach into fairy tale sculptures, while the grounds outside took on a carnival atmosphere. For those thinking of coming to Clearwater Beach, or one of the nearby beaches in the area, April might be the month to consider. 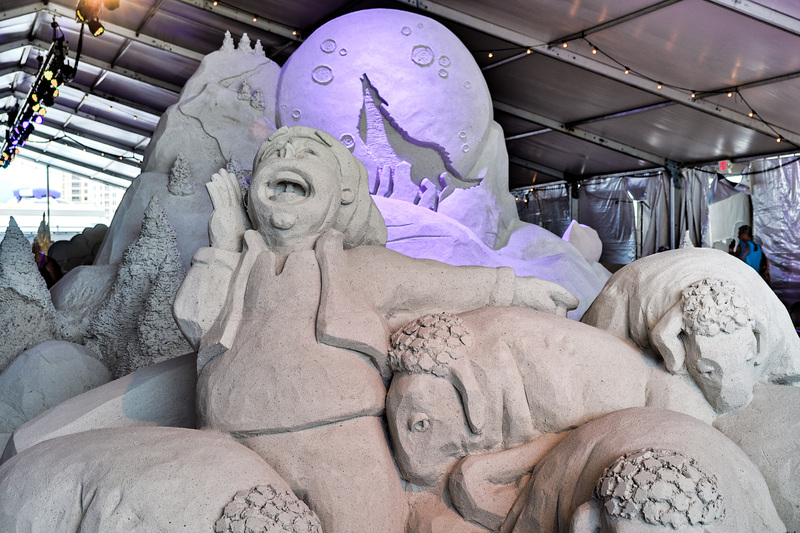 If you enjoy fascinating art and a dynamic atmosphere, the Pier 60 Sugar Sand Festival is for you. 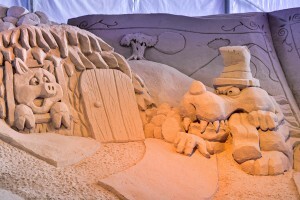 1 Comment on "Fairy Tales in the Sand at Clearwater Beach"
Wow, I can’t miss this event next year.